Home News Smartphones Alcatel One Touch Insight 993D: Experience a Better Android with a Better Performance for only P9,990! 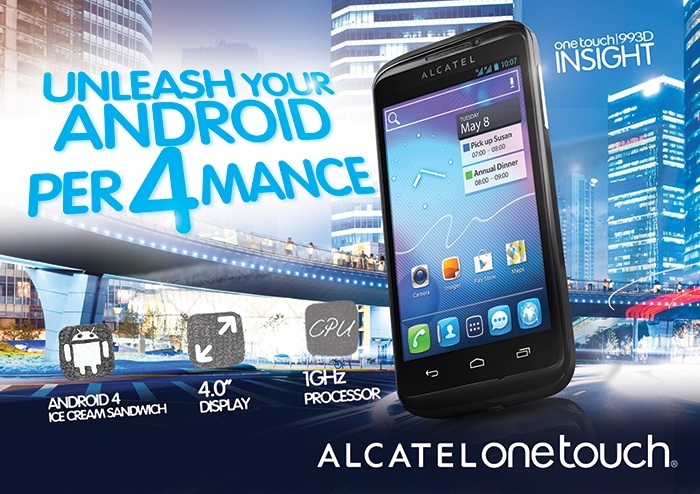 Alcatel One Touch Insight 993D: Experience a Better Android with a Better Performance for only P9,990! Imagine when Art and Technology finally choose to settle down? It gets better, what if Art and Technology finally find their place in a phone? 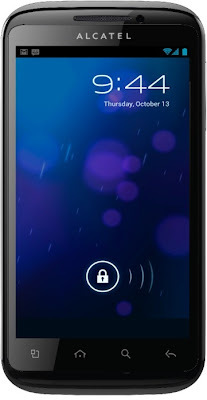 Alcatel One Touch takes pride in its latest entry to the Android Market. The ALCATEL ONE TOUCH INSIGHT 993D is inviting you to explore a new world and treat yourself into an experience that goes beyond beauty and transcends performance. The ALCATEL ONE TOUCH INSIGHT 993D boasts of its sleek and excellent design. It exudes a 4.0’’ WVGA screen display that will make you enjoy viewing videos and at the same time provide an optimized experience because of its high performance chipset. Headlining its’ 4.0 Ice Cream Sandwich operating system, the ALCATEL ONE TOUCH Insight 993D offers a different, fast and smooth Android experience. It runs on a 1Ghz processor, allowing performance to function at a better pace. Enjoy a faster experience when browsing the web, playing applications and getting things done without the hassle. The ALCATEL ONE TOUCH Insight 993D is equipped with a highly responsive user interface and a .3mm touch lens to have a smoother navigation. The capacitive touch of the phone makes it easier to type messages or even to browse through photos. Connectivity is also a key function among smart-phones and the Insight 993D takes a deeper look with the DLNA (Digital living network alliance) feature, which enables you to share multimedia files over platforms. It also has powerful Bluetooth and wi-fi functions. Power-users on the go will also take comfort on the idea of files that are for back-up and storage with the One Touch cloud back-up. No matter how big the files may be, you know they are safe. Go social and download unlimited with the Google Playstore and get the option to store more as the external storage can be upgraded up to 32GB. Crazy for games? The G-sensor feature of the phone gives a better gaming experience, allowing you to win car races efficiently. Love the idea of taking pictures for leisure or for business? The Insight 993D has a 5 megapixel camera which ensures better image quality. It also includes a front-camera, perfect for video chats. People who are wired to more than one network will also feel the convenience and functionality of the dual sim port. It is also wi-fi hotspot ready. This beauty and performance in a whole new look is coming out in the market for only P9,990. It’s time to treat yourself and dive into a whole new world. Availability: NOW OUT IN THE MARKET!